Can Amy, Jonah, and the rest of the crew keep the doors open for season three of the Superstore sitcom? As we all know, the Nielsen ratings typically play a big role in determining whether a TV show like Superstore is cancelled or renewed for a fourth season. Unfortunately, most of us do not live in Nielsen households. Because many viewers feel frustration, when their viewing habits and opinions aren’t considered, we’d like to offer you the chance to rate all the season three episodes of Superstore below. 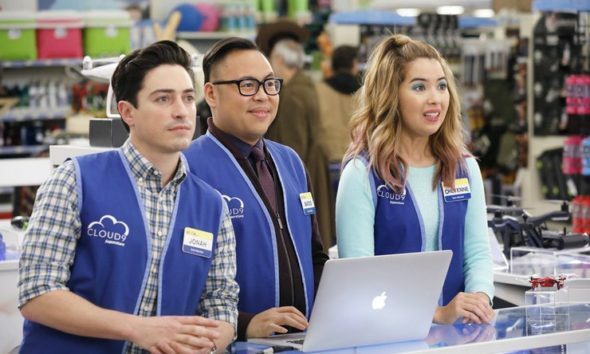 Airing on the NBC television network, Superstore stars America Ferrera, Ben Feldman, Colton Dunn, Nico Santos, Nichole Bloom, Mark McKinney, and Lauren Ash. This sitcom revolves around the diverse employees at a super-sized megastore called Cloud 9. Amy (Ferrera) is the glue that holds the place together while newer hire Jonah (Feldman) wants to prove that work doesn’t have to be boring. From bright-eyed newbies to seen-it-all veterans to the clueless seasonal hires and the in-it-for-life managers, the crew tackles the day-to-day grind of rabid bargain hunters, riot-causing sales, and nap-worthy training sessions. What do you think? Which season three episodes of the Superstore TV series do you rate as wonderful, terrible, or somewhere between? Should NBC renew the Superstore show for a fourth season? Don’t forget to vote, and share your thoughts, below. Amy is the “straight man” in the show. She balances the other weirdos. NBC needs to realize that some people work at night and they catch up on their showes through Hulu or on demand! This is one of the VERY Best sitcoms on these day!! Last nights episode was an instant classic!! Really…if you have not watched this show, you should! It is very funny and well written. I love this show and hope to see lots more seasons to come.